After the presentation of Credentials, Dr. Perera held discussions with the Secretary General on matters of mutual interest. The one-to-one meeting was held in a very cordial manner. Welcoming the new Permanent Representative, the Secretary-General stated that a positive environment has been created by the policies of the new government in Sri Lanka for a greater collaboration with the United Nations and the international community. 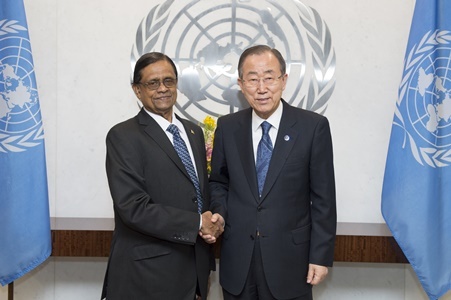 The Secretary-General assured of his support and that of his staff to the new Permanent Representative in pursuing initiatives for greater cooperation between the United Nations and Sri Lanka. Prior to his appointment as the Permanent Representative of Sri Lanka to the United Nations in New York, Ambassador Perera served as the Legal Adviser to the Ministry of Foreign Affairs for a period of over thirty years. He chairs the United Nations Ad-hoc Committee on Measures to Eliminate International Terrorism, established by UNGA Resolution 51/210, which is currently negotiating the Comprehensive Convention on International Terrorism. He has also served as a member of the International Law Commission from 2007 to 2011. In May, 2010 Dr. Perera was appointed as a Commissioner of the Lessons Learnt and Reconciliation Commission (LLRC). The Report of the Commission has been broadly welcomed, domestically and internationally. Ambassador Perera has published several books on international law and contributed articles on international law topics to a number of Law Journals. Ambassador Perera is a past student of St. Thomas’ College, Mt. Lavinia. He is married with two children.